This being the Keynote Address as delivered by Dr. Muhammad Ali Pate, global health expert and former Minister of State for Health, Federal Republic of Nigeria. Dr. 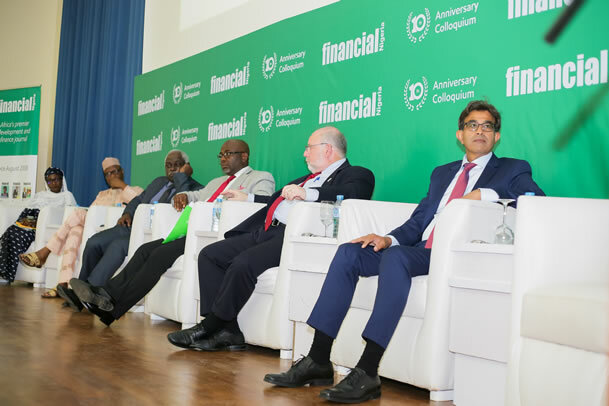 Pate spoke at the 10th Anniversary Colloquium of Financial Nigeria magazine, which held on September 11, 2018 at the Shehu Musa Yar'Adua Centre, Abuja, on the theme: "Nigeria's Sustainable Development Agenda." Let me start by expressing gratitude to Mr. Jide Akintude, Publisher of Financial Nigeria and the Organizers of this beautiful event for their gracious invitation. 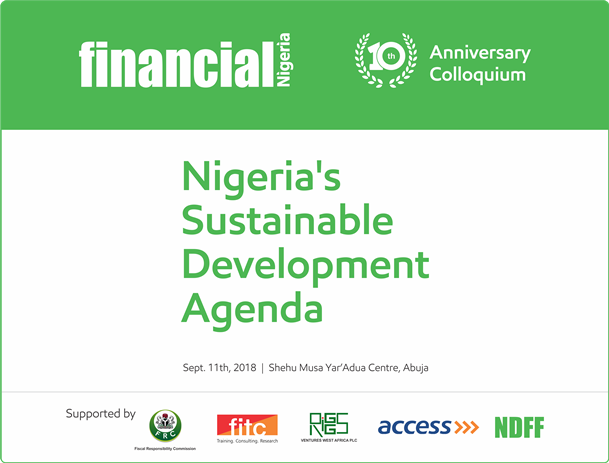 This event could not have come at a better time, when Nigerians – professional politicians, technocrats, citizens – and friends of Nigeria are in conversations regarding both the immediate and long-term direction of the country. In these remarks, I intend to first, situate the discussion on Nigeria’s sustainable development agenda within the historical context of the global Sustainable Development Goals (SDGs). I will share my thoughts on where we are relative to the SDGs, present some of the underlying reasons of our performance as a country and lay out an agenda for how we can make progress on sustainable development. I will use the definition of sustainable development from the original Brundtland Commission Report (1987) as: “development that meets the needs of the present without compromising the ability of future generations to meet their own needs”. Following a series of milestones, in 2000, at the United Nations’ Millennium Summit, 147 heads of state adopted the Millennium Development Goals (MDGs) in an unprecedented effort to fight extreme poverty in a comprehensive manner. The MDGs set out goals that covered income poverty, hunger, primary education, infectious disease, maternal and child health, gender empowerment, environmental sustainability and global partnership for development. The MDGs were to be achieved by 2015. The MDGs marked a watershed moment in global mobilization to achieve worthwhile social priorities. They promoted public consciousness, tracking of results, pushing for political accountability and generally piling pressure on leaders to focus on developments that matter to the people. One of the greatest global philanthropists of our time is reported to have remarked that the MDGs became a type of global report card for the fight against poverty from 2000-2015. Each country then had a basis to assess its performance in a standardized manner against those important global goals. The MDGs worked, to a large extent. Remarkably, by the end of 2015, the number of people worldwide living in extreme poverty had declined by more than half, primary school enrollment had increased and children out of school had reduced by half. More girls were in school and more women in paid employment, significantly reducing gender inequality. In the health sector, the global under-five mortality had reduced by more than half, maternal mortality ratios declined also by nearly a half. The spread of HIV and malaria had slowed down considerably. These were global achievements made possible due to determined actions by several countries and global solidarity that was rarely seen previously. The MDGs helped to focus the international community on the most important priorities. Our world was the better for it. But there were many variations and shortfalls in achievements, which were especially disappointing for low income populations in several countries, particularly in Africa. In our case in Nigeria, the bottom line is we failed to reach many of the MDGs targets. Whereas average poverty rates had by then slightly declined, the declines were not enough to reach the MDGs target and have since reversed. The observed declines in maternal and child mortality, as well as infectious diseases like HIV and malaria, were also not to the level targeted in the MDGs. Perhaps, more concerning is that inequality had increased in multiple dimensions. While the average statistics for Nigeria did not show much progress, we must also acknowledge significant intra-country variation in performance within Nigeria, which makes the picture even more dismal in some States than the average for the country. A state like Ondo, was able to reach its MDGs health targets, even though its progress alone was not enough to tip Nigeria over all to achieve the national targets. States in the north-east did not make much progress and may even have headed in the wrong direction on some indicators. Building on the lessons from the MDGs-era, in 2015, the UN oversaw another global treaty built around a shared focus on balancing economic, social and environmental objectives, as cornerstone for sustainable global development. The 17 Sustainable Development Goals (SDGs) to be met by 2030, now represent a new global compact, which, if achieved, will put our world in a positive and more sustainable trajectory. The SDGs specifically deal with ending extreme poverty; achieving zero hunger; good health and well-being; quality education; gender equality; clean water and sanitation; affordable clean energy; decent work and economic growth; reducing inequalities; sustainable cities and communities; responsible consumption and production; climate action; life below water and on land; peace, justice and strong institutions; and partnership for the goals. As you can see, these goals are mostly inter-related and inter-dependent, but build on balancing the three pillars of economic, social and environmental objectives for global sustainability. For each of these goals there are specified targets for countries to achieve. Now I come to the unglamorous portion of my remarks; please bear with me. We must speak candidly, to understand the gravity of the challenges facing our country. I will try to not bore you here by dishing out detailed statistics, which you can easily find through various public sources. I will focus my remarks more on what those statistics should tell us. Poverty: Recently, World Poverty Clock, an NGO that estimates and tracks the number of world’s poor, reported that Nigeria has surpassed India to become the global capital of poverty, with 87 million people living on less than $1.90 per day and that number is rising. This is a central and one of the most devastating facts on the situation we have found ourselves, after extracting almost $1 trillion worth of oil since our national independence. We have effectively squandered an opportunity to utilize the natural resources we obtained purely by chance; instead of investing to uplift our peoples’ lives, our political elite, by commission or omission, chose the path of short-term comfort and purchase of loyalty through economically unwise, or corruption-riddled national expenditures, at the expense of economically-sound investments in both human and physical assets to transform our nation. As we head to the SDGs end-date, in the next decade, what is at stake for Nigeria is clear, given that, the first goal, ending extreme poverty is already going in the wrong direction. Nigerians are getting poorer, and unless our economy is transformed, the prospect in the next few years do not appear as bright as we think it can be. Population: A “big elephant in the room” is Nigeria’s population dynamics. We have a large and fast-growing, youthful population. By the year 2050, it is likely that our population, based on current estimated growth rates, will be more than 400 million, making us the 3rd or 4th most populous country in the world. There are economic benefits for a nation from having a youthful population when they are gainfully employed. This potential benefit, also called the demographic dividend, results when the share of the working-age population is larger relative to the non-working-age, dependent population. During the transition’s early stages, mortality rates among children fall. When child survival improves, parents are likely to feel more confident about reducing desired fertility rates and women become better able to participate in the broader labour force. The critical stage is when the labour force grows more rapidly than the population dependent on it (the dependency ratio starts to fall), freeing up resources for investment in economic development and an opportunity for rapid economic growth, provided the right social and economic policies are in place. These policies include those related to reproductive health, education of girls and empowerment of women, and reducing child mortality, enabled by good governance and decent economic growth. The period during which a demographic dividend (economic benefits of a youthful population) may be realized can last a few decades. Later, when the older ones also invest their savings or through pensions, further extension of the dividend occurs. This assumes they have the savings or pensions left to invest. Our present situation is that the north-east, north-west and north-central zones have remained with stable population structure in the last 5 decades, with continued high child mortality, higher fertility and dependency ratios. The south-east, south-west and south-south zones are already undergoing demographic transition with ageing becoming prominent particularly in the south-east, potentially raising the dependency ratio in that zone as well. This implies our demographic transition is slow, variable and achieving the dividend is not guaranteed. Hunger and Nutrition: According to the recent Multiple Indicator Cluster Survey, while infant and under-five child mortality have improved compared to 2011 levels, the prevalence of childhood wasting, and stunting are all going in the wrong direction, particularly in northern Nigeria. In some areas in the security-challenged north-east, stunting rate is more than 60% among children under-five years old, while overall, 43% of Nigeria’s children are stunted. Maternal undernutrition, for both macro and micro-nutrients, is still high. The most consequential effect of childhood malnutrition occurs in the brain – a malnourished child’s brain’s neurons (the “grey matter infrastructure”, to quote my good friend Dr. Akinwunmi Adesina) are clumped abnormally – resulting in cognitive deficits, lower intelligence, lower school performance and educational attainment, and lower lifetime income. In effect, by allowing our children to be stunted at this high level, we are by extension allowing our national economy to be stunted way into the future. Health: Regarding health and well-being, the population health status of Nigerians is still sub-optimal when compared to other countries in the African region who have lower human and material resources. Initiatives over the last 10 years in the health sector, such as drives to increase immunization, deploy midwives and community health workers to primary health care centres, and results-based financing such as Saving One Million Lives, started during the Yar’Adua/Jonathan era and extending to the present day, have led to improvements in infant and child mortality. However, we still carry a disproportionate burden of maternal and child mortality, as well as infectious disease, such as mother-to-child transmitted HIV infections. We face triple burden of disease – background infectious diseases like malaria, tuberculosis, HIV, pneumonia; rising non-infectious diseases like diabetes, hypertension, heart disease, cancers and mental ill-health; and rising new and old forms of injuries. Many of our citizens are financially vulnerable to the risk of ill-health. Only a few elites can afford good health care in the private sector or abroad. The National Health Insurance scheme has become distracted and stagnated. Unless we break through, the prospect for universal health coverage is nothing but empty rhetoric. Education: Nigeria’s education system is in a state of crisis. At the basic education level, public education is largely dysfunctional and of poor quality. Private education for those who can afford is the option that, most well-to-do parents choose. In some parts of the country, literacy and numeracy rates among 5-16-year-old children are only about one-third. More than 10 million children are out-of-school. We have become numbed to accepting a form of social apartheid, where children of the poor are left to a broken education system while the elites send their children to private schools or abroad. Meanwhile, all available evidence shows that national investment in quality education is among the best investments that a nation can make for its future. In addition, we are grossly under-investing as a nation in research and development at the level of our tertiary institutions. Youth employment and gender: The prospect of our reaping a demographic dividend depends not only on quality education, but skills and economic opportunity for our youth, girls and women. Youth employment is currently at the highest levels of 33.1% (NBS). This does not include under-employment. Girls and women are systematically marginalized in the political and economic arenas. This represents huge lost opportunity for the country to boost its developmental prospects, beyond achieving the SDGs. Contrary to prevailing rhetoric, when one looks at actions, it is clear we do not yet, as a nation, value sufficiently the input of our youth in the political, social and economic arenas. Urbanization: Linking rising poverty, fast population growth, poor health and education, youth unemployment, with the background trend of increasing urbanization, you will see even more challenge in terms of Nigeria’s sustainable development. Our cities, Lagos, Kano, Abuja, Onitsha, Port Harcourt, Bauchi and others, are already mostly struggling with poor infrastructure, housing, water, sanitation, social dislocation and environmental pollution. So, you can imagine that with both increased population and urbanization trends what the picture might be in the years ahead. Unless we get ahead of the curve and plan and execute appropriate policies and interventions. By now, you all get my drift; we are not on track for the SDGs. If we go through the rest of the goals, clean water and sanitation, affordable clean energy, industry, innovation and infrastructure, inequalities, sustainable cities and communities, climate action, peace, justice and strong institutions, you will notice the same pattern that we have a lot of work ahead to return on track for its sustainable development. Stewardship and governance – We have lacked leadership (plural) that embodies the spirit of stewardship. This is one of the central reasons for our lack of performance as a country. We have had individuals who could exercise authority, but who failed in exercising leadership as stewards of our heritage and commonwealth, which belongs to current and yet unborn generations of Nigerians. The lack of a stewardship mindset is reflected in our dysfunctional politics, where politicians are scrambling to seek for this office or the other, without articulating a clear vision of where they would lead us or much of ideology or developmental agenda other than getting into office. Our political system has consequently adopted mediocrity as its central ethos, without regard to competence or character. Instead of pursuing development, some of our political leaders appear to be consumed perpetually with the “next” election. Political parties have been reduced to mere vehicles for entry to office. Even the current ruling APC, which came to power with popular mandate in 2015, is now on the verge of making a similar or worse blunder as the PDP, if it adopts a dual track measure of justice for its aspiring candidates in the upcoming primaries – one for the President as popular, another for the State Governors, defined primarily by self-interest and lack of respect for popular will. As a result, our governance system has become unstable, inconsistent and exclusive. Rarely do we speak of overriding national interest or take policy decisions based on it. Policies are more anchored around narrow political cycles, while development and transformation require a longer-term perspective. Policies have become reactionary and short-term, and governance has been reduced to a series of projects. We hear highlights of numbers employed or money distributed, or handouts given, without articulation of any structural changes in our economic or political system which good governance entails. While the current structure of the country needs to be revisited, to deepen our fiscal federalism beyond sharing at the monthly FAAC allocation meetings, political leaders appear stuck. Nominally, we operate a three-tiered federal system but functionally it is only two-tiered, as many Local governments are dysfunctional. Fighting corruption has sometimes become limited to symbolism, while the social epidemy has continued. Otherwise, how can we explain that a popular party that came to power to fight corruption, is asking its aspirants to spend up to equivalent of US$120,000 to apply for candidature, in a country where almost half the population is living on less than $1.90 per day? Political and administrative accountability mechanisms are weak or almost non-existent, and arbitrariness is in some areas is becoming the norm. Epidemic proportions of unresolved grievances and conflict, violence and humanitarian emergencies, further undermine the legitimacy of the Nigerian state. Over time, the legitimacy of the state itself has become eroded. Evidence shows that the Nigerian state has remained in the bottom 10 on rankings for state legitimacy. Security system is fragile with frequent eruptions of violence among citizens and between citizens and the state. As some politicians stoke ethnic, religious or other parochial reasons for violent conflicts, the poor, whether farmers or herdsmen, continue to be shafted by a political system that has not delivered much for either group. Some leaders at local and national levels have also sometimes failed to rise above our narrow differences to identify means for preventing violent conflict and peace-building. Lack of economic diversification – The discovery of oil appears to have stunted our national psyche and we have since become dependent on that single commodity. Consequently, our economic growth has become tied to the volatility of oil prices. The easy money from sale of crude has made our governments, until recently, incapable of aggressive efforts to diversify the economy. Millions of our people are not yet included in the financial system itself. We have not focused on improving agricultural productivity, value-addition, or aggressively pursuing industrialization. To compound matters, we still borrow from the future to finance present imported hydrocarbon consumption, as the downstream oil and gas sector has remained under-developed. We chose to spend or allow to be stolen almost half of the $1 trillion earned from oil in the last 50 years, instead of building the requisite infrastructure (roads, rail, power, etc.) to connect our economy, create value chains and ease the cost of doing business. Ours is like a circus elephant that has allowed itself to be controlled by a twig, thinking that it had no power. This African giant has slept for too long. Lack of institutional capacity – The core institutions of state, except for a few, have witnessed atrophy of their capacities over time. 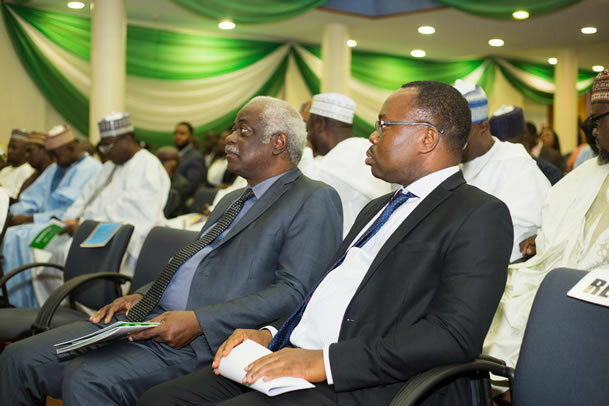 While federal and a few of the state civil service have retained a modicum of capacity, in many states and local governments, there is lack of capable, competent people. Systems and procedures are absent, distorted or circumvented. Public expenditure management, regarding planning, budgeting, procurement, payments and controls have become inefficient and, in many cases, wasteful. Regulatory institutions have adopted predatory postures, so citizens and market players are forced to continually adopt evasive maneuvers. Gap between skills and labour market – needs among the youth, due to a large extent on sub-optimal performance of the public education system. Members of the elite send their children to private school or abroad, while the poor are either out of school or attending schools that provide low quality education. It is not all education that is good investment, only quality education is a good investment. The children of the poor are mostly left with lower quality education. Therefore, the prospects for upward social mobility are reducing. Until recently, Nigeria’s Gini coefficient was increasing in the wrong direction. Since 2011, there have been efforts to start the foundations for a social safety net system, with piloting of initiatives such as CCT. These schemes have only reached a narrow segment of those desperately poor, and whose numbers continue to rise. Ease of doing business – is improving, but still lower than many other countries. Consequently, business investments are below what the Nigerian market could have commanded, further reducing opportunities for employment and economic growth. Poor quality infrastructure and predatory regulation and corporate taxation hampers business creation, entrepreneurship and quality job creation. Lack of focus on implementation and results – even where policies and programmdes are well-designed, we have tended to fall short when it comes to efficient and effective execution. This situation is linked to both weak institutional capacities (people, systems and procedures) as well as to mind-set that focuses on achievement of results. Inadequate attention to data and accountability – whereby facts are made up, data is not routinely and rigorously collated, analyzed or used. Therefore, our policy debates tend to be factually sterile at best, or shallow and wrong. Without good, routine data, it has become nearly impossible to hold anyone accountable; lack of performance is hidden or explained away without consequences. Community and civic engagement – whereby governments pretend as if they mandated themselves and not the people, while the people accept mediocre performance on the part of governments without holding them answerable. The peoples’ voices are largely not solicited or heard on important matters. Community leaders, religious leaders, youth and women groups have sometimes been reduced to pawns in the political chess games rather than key stakeholders in governance. 2019 – This is a pivotal moment – a decade before the end date of the SDGs. We must democratically elect a cohort of leaders (Presidency, National assembly, State executives and Assemblies) who have track-record of competence, character, integrity and vision to exercise the quality leadership necessary for our country to rise from its current doldrums. Political stability is key. Here I think the suggestion to consider single tenure for executive positions and term limits for legislative offices are pertinent. We can go ahead and decouple elections of executive and legislative offices, so that each arm of government may go through its round of elections, independent of the other, and based on its records. For example, if executive positions are single term of 6-7 years, legislative elections could be limited to 2-3 terms of 4 years each as maximum. These could be done after the 2019 elections as part of a necessary review of the constitution (see also below). We must also reform our political parties and election system, for example, through stronger, enforced campaign finance laws, as well as regulations to govern political lobbying. These measures will help strengthen internal party democracy, sanitize our political system, enhance political accountability and lay good foundation for better governance and rational policies that will usher in sustainable growth and development. Confront the structural issues through a constitutional review – The new or renewed cohort of leaders in 2019 will need to confront the structural issues facing the country and devise means for achieving national consensus on key issues that will balance political, economic, social and environmental objectives of the country. They would need to rebalance the structure of our fiscal federalism, to empower the states and allow them to compete favourably, while providing essential social safety for marginalized and vulnerable groups. Issues like national representation, internal security, policing, derivation and roles of the federal, state and local governments in health and education should be put on the table for resolution. By so doing, we will restore peace, prevent violent conflicts and enable prosperity to reign. Build institutional capacity and fit-for-purpose governance – The new or renewed leadership in 2019 should address gaps in institutional capacity, through placement of capable people and processes to improve performance of our public institutions across the board. We must promote culture of policy entrepreneurship and innovation in public service as well as the private sector. We should focus on improving governmental effectiveness, modernizing and professionalizing our bureaucracy, to plan, execute and monitor government policies and programs. Instead of our governments focusing on whole range of issues to tackle all at once, and doing neither effectively, we would need reforms to streamline the areas for government interventions, attract our best brains into public service, strengthen regulations, open space for easier private participation in the economy, while protecting social welfare for the poor and vulnerable. We should also rigorously track performance, using new technologies and means to systematically collect and present data for use in administrative and political accountability. This is particularly critical at Local Government and State levels. Focus intensely on human capital development – Acknowledging Nigeria’s youthful population as an asset, we should accelerate universal access to quality basic health services, including immunization and reproductive health, for all Nigerians. We should strive to end HIV/AIDS, Tuberculosis and Malaria. We should also pursue multi-sectoral actions to eliminate childhood malnutrition and stunting, as a key priority of governments at all levels. This would boost the brain power of the youthful Nigerian population and serve us well into the future. We should urgently reform the entire educational system, from basic, to secondary, vocational/technical and higher education, with a view to quality and equity in access and outcomes. We should leave no child behind. This will imply curriculum reforms, both for students as well as teachers, system redesign, changes to education financing at all levels, innovation in delivery, measuring, tracking and using data, improving accountability, teacher quality, leadership and management, covering both public and private sectors. Second-chance and remedial education will be key, especially for the millions of children already left behind. We should increase the voice and presence of youth and women in governance and the economy, protecting and mandating their participation by law or policy. We should also accelerate development of effective and targeted social safety mechanisms, particularly for elderly and disabled citizens. Focus on economically viable, critical infrastructure for economic growth – Based on sound economic case, we should crowd-in private sector and development finance investments for economically viable critical infrastructure, such as power, housing, road, rail and transportation networks, water, sanitation and information technology. Effective systemic fight against corruption will make these infrastructural investments more affordable. Given our market size, large-scale private and development sector investment in infrastructure will become much attractive as we improve the overall business environment. This will improve our national competitiveness, attract good investments and enable faster diversification of our economy. We must do these in ways that are inclusive and equitable, while specifically increasing participation of those currently excluded in the financial system. Address urbanization, housing, environment and quality of life – As our cities grow, we should insist on deliberate and long-term planning for modern, environmentally sustainable cities. This will require anticipating needs of both youthful and ageing populations, migrants, considering utility, safety, health, well-being and overall quality of life. Harness the potentials of Nigerians in the Diaspora – Instead of seeing them as competitors, we should encourage Nigerians in the Diaspora to be contributors and collaborators, through institutionalized mechanisms. There are millions of children of Nigeria doing amazing things in the Diaspora. We need pragmatic approaches to tap into their energy and align them with those at home to assist us in innovating or leap-frogging our way. Increase civic engagement – We should mobilize the tremendous energy of teeming youth, women and popular figures to establish a culture of volunteerism. We must begin to ask, “not what your country can do for you, but what you can do for your country.” (JFK) We have to tap into the social capital existing in our communities, through various traditional and religious institutions to change value systems, aid in fight against corruption, promote peace building and be our neighbour/brother/sisters’ keeper. We should also provide appropriate incentives and regulatory framework for organized philanthropy by individuals and corporates. Nigeria is challenged on multiple fronts on its path to sustainable development. But, despite those challenges, it is possible for us to transform her trajectory to become a beacon of hope and greatness on the African continent and beyond. Competent leadership is the key and everything else follows.